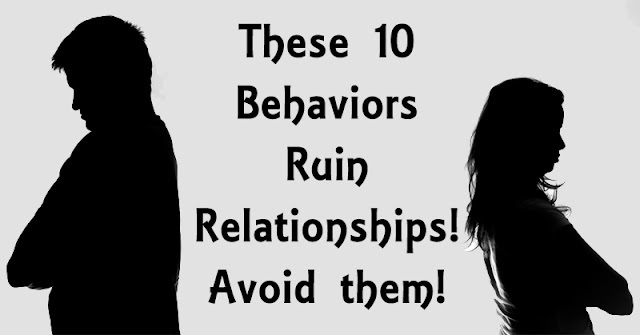 Fun & Inspiration These 10 Behaviors Ruin Relationships! Avoid them! Acting like you’re single shows that you don’t have respect for your partner. If you’d rather go out without checking in, or constantly make plans with other friends without involving your significant other or keep things from your partner, maybe it’s because you’d rather be single. Being in a successful relationship requires commitment and accountability. If you and your partner share a bank account, spending money without thinking about the other person can lead to arguments, broken trust and eventually, a break-up. Sharing finances means you have a responsibility to your partner to spend money wisely and to consult with them before making any large purchases. Being able to spend time alone with your hobbies and interests is important in a healthy relationship. If you and your partner are constantly together, you won’t be able to have your own life, friends, interests, hobbies and alone time. Being too dependent on your significant other can deprive you of living your own life. Insecurity is a common problem, but it can lead to the demise of a relationship. Insecurity can cause jealousy, create trust issues and turn into a reoccurring theme in arguments. Without trust, a relationship can’t last, so you have to find a way to work through your insecurities. Rolling your eyes, being sarcastic and having no regard for your partner’s feelings are all forms of disrespect. When disrespectful behavior escalates, someone is bound to get hurt. Finding humor in tough situations can be helpful, but constantly poking fun at your partner can be hurtful. Relationships can fall into a rut. Romance can fizzle out and the magic can disappear. When you see that start to happen, going out of your way to show affection is the best way to rekindle the fire. If you wait too long, it might be too late. Social media is huge these days, and it’s also caused an end to many relationships. Texting or being on your phone instead of communicating with your partner shows a complete lack of interest. Put the phones away when you go out to eat, watch a movie, or whenever you’re spending time together. Dishonesty is a relationship killer. If you can’t be honest with your partner, then you don’t belong in that relationship. If you are the one being dishonest, find a way to break the cycle before your relationship suffers. If you’re constantly being lied to, it’s probably time to move on. Compulsive behaviors are red flags when it comes to relationships. When a person is unhappy, they tend to reach for something else. Over-indulging in food, alcohol, shopping or any other vice is a sign that something is off, and a much-needed conversation is in order. Contrary to popular belief, nagging isn’t the fault of only one person in the relationship. Nagging occurs when one person repeatedly makes a request, the other person ignores it, and both become increasingly annoyed. The best way to end nagging is to address the issue. Both partners need to work to eliminate it from the relationship. Take a look at what love really is!